BMW has a great new concept that will show at the 2013 Frankfurt International Motor Show that comes in the way of an X5 eDrive. 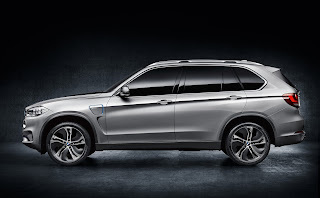 The SAV (Sports Activity Vehicle (as BMW puts it)) has their TwinPower Turbo inline 4 cylinder engine that gets over 70mpg imp and a range on all electric of 19 miles. The blue color that makes the eDrive stand out was "developed," not picked out of a Crayola box. 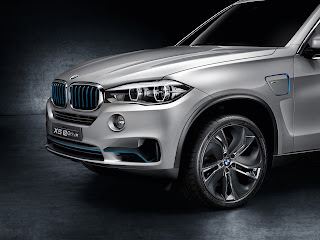 BMW i Blue color represents the i Brand from BMW putting a perfect understanding to clean technology that also helps accent the flawless design that helps the SAV with aerodynamics and ground breaking character. I cannot get over the wheels! I love all 21 inches of them!! The perfect tie for a perfect suit. "Munich. The new BMW X5 raises efficiency to another new level in the world of the luxurious Sports Activity Vehicle (SAV). BMW is using the 2013 Frankfurt International Motor Show (IAA) to present the logical next step towards landmark efficiency in the SAV segment. 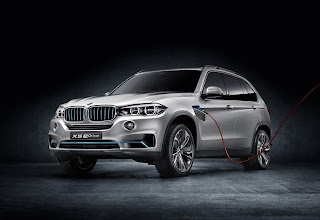 The BMW Concept X5 eDrive combines the brand of driving pleasure for which the xDrive intelligent all-wheel-drive system is renowned and a luxurious ambience within the variable-use interior with a plug-in hybrid drive concept. Its innovative BMW eDrive technology guarantees the hallmark sporting ability of a BMW, while at the same time opening the door to speeds of up to 120 km/h (75 mph), a maximum range of 30 kilometres (19 miles) on electric power alone and average fuel consumption in the EU test cycle of 3.8 litres per 100 kilometres (74.3 mpg imp)." What do the numbers on car tires mean?